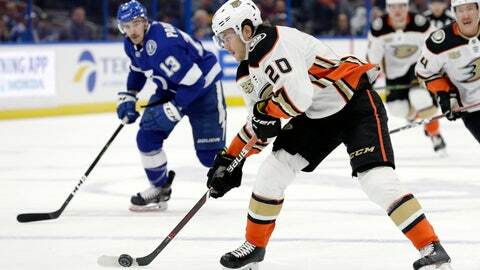 The host Florida Panthers and the visiting Anaheim Ducks — two franchises that entered the NHL together in 1993 — will meet on Wednesday night at the BB&T Center. Meanwhile, the Panthers have never won the Stanley Cup. They won a conference championship in 1996 — the greatest season in club history even though they came up short in the Stanley Cup Finals — and they earned division titles in 2012 and 2016. However, Florida’s Jonathan Huberdeau scored with 1:29 left in regulation to tie the score 3-3, and Mike Hoffman scored in overtime to exorcise the demons from the Chicago game. Florida’s main problem is on defense as they entered the week ranked next-to-last in the league in goals allowed. The Panthers are killing just 75 percent of their power plays — only three teams are worse — and they are without their top goalie, Roberto Luongo, who has missed two straight games due to a lower-body injury. Backup goalie James Reimer, who got Florida’s win on Monday, will likely be in the nets, and the Panthers offense is led by five players who all have between 20 and 23 points: Hoffman, Evgenii Dadonov, Huberdeau, captain Aleksander Barkov and power-play quarterback Keith Yandle. Meanwhile, the Ducks are without their top two defensemen — Cam Fowler (broken jaw) and Hampus Lindholm (lower body).